Happy Tuesday, everyone! :) I hope your week is going well so far. I just wanted to pop in and let everyone know that the Disney Store website is currently offering free shipping with the purchase of any new item. The promo code is SHIPNEW. So for any of you out there (like me) who are planning on purchasing some of the new Classic dolls, now is a perfect time to buy them. ;) You can see all of the new items that qualify for free shipping HERE. 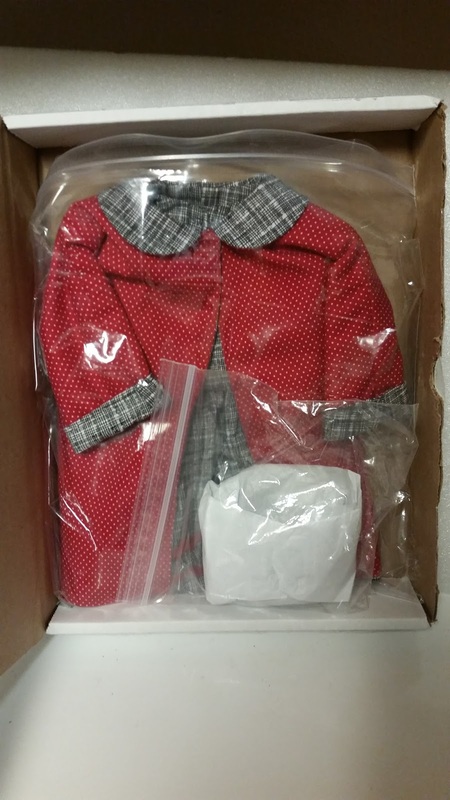 I also wanted to remind everyone of the current giveaway on the blog, a free 18" doll dress, coat, and pair of shoes from Etsy seller MarcotsGirlsDolls. The giveaway is open until this Saturday, so be sure to enter soon. You can see all of the details in my previous post HERE. Back in my earlier days of collecting, I was constantly on the lookout for Regency era dresses for my 18 inch dolls. That led me to the online seller MarcotsGirls, also known as Gloria. ;) I was impressed with the quality of her work, the reasonable pricing, and the variety of styles and eras of doll dresses she had available. I originally discovered Gloria's work on eBay, but these days she does the majority of her online transactions Etsy.com, where I recently rediscovered her at her Etsy shop, MarcotsGirlsDolls. 1. Thanks for joining us on the blog today! :) Could you tell us how you got started with sewing doll clothing? My two daughters and I started making and selling 18 inch doll clothing about fourteen years ago. 2. What is the first doll you can remember getting? I remember way back when I was about ten years old, getting a 20 inch or taller doll that came with a hair dryer-the vintage type that you actually stuck your whole head into. 3. What is your favorite type of doll to sew for? Eighteen inch dolls, followed closely by the 16 inch A Girl for All Time dolls. Until recently, I primarily created historical fashions. Now, you'll find both historical and contemporary outfits in my Etsy store. 4. What is your favorite era of period clothing to capture in doll form? 5. How do you come up with ideas for your doll outfits? I visit museum collections, both online and in person. I also get a lot of suggestions from my adult daughters and friends. Television and movies are also great for inspiration. But usually, I buy a fabric I like with a particular style and time period in mind. The trims and little changes that we do help to make a dress unique. 6. Do you have any advice for people who would like to start sewing clothes for their dolls? My advice to anyone starting to sew doll clothes for the first time would be: start simple. Your expertise and knowledge will grow as you gain experience and confidence. You can find my shop at https://www.etsy.com/shop/MarcotsGirlsDolls. You can keep up with any news about additions to my shop or sales by liking my Facebook Page. On occasion, I still offer a few items via eBay under the seller name marcotsgirls. 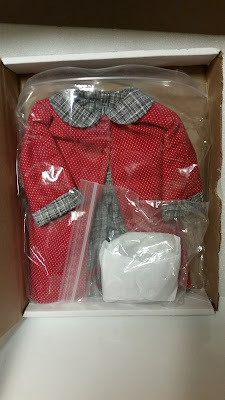 As I mentioned earlier, Gloria very graciously sent me a doll dress for a giveaway here on the blog. The giveaway prizes include an adorable 1950s era dress, a reversible matching coat, and a pair of doll-sized saddle shoes. The dress and coat were handmade by Gloria. The shoes were not, but were included as a fun accessory for the outfit. The bodice and skirt have pretty, bright red rickrack embellishments. The back of the dress has Velcro closure. I love the fun black and white criss-cross pattern of the material. The saddle shoes are just adorable. They went on Emma's feet easily and look great with the black and red of her dress. The outer material is a fun red and white polka-dot pattern. The coat has snap closure at the neck. Or, if you're feeling like a change, the coat is reversible. And the same snap closure at the neck. 2. If you're under eighteen years old, please get a parent or guardian's permission before entering. I'll have to get your mailing address, and I want to make sure that's acceptable to them. 5. The giveaway will be open for entries until Saturday, July 2nd. On Sunday, July 3rd, I will chose a winner by random drawing and send them a confirmation email. 6. The winner will have one week to email me back with his or her mailing address. If I have not heard from the winner by Sunday, July 10th, a new winner will be selected. 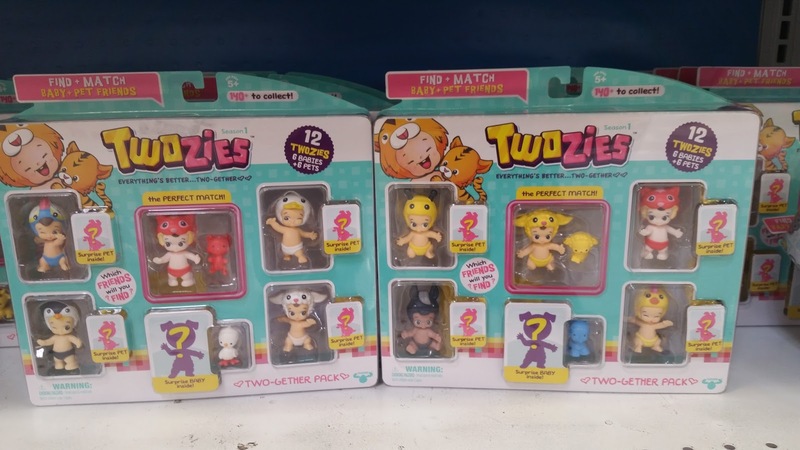 As promised in an earlier post, today we'll take a closer look at the newest offering from Moose Toys: the Twozies. 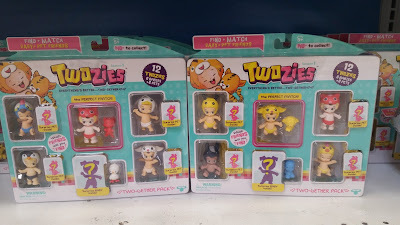 The Twozies are a series of little babies and their animal friends. The babies wear animal hats that match their pet pals. The catch is that the pets and babies are all mixed up, so you have to try to match the pets with their babies, without knowing which figures you'll find in each set. I know I shared the following pictures before, but just for context, I'll share them again. ...and still larger packs for $9.99, which include six babies and six animals. Each twelve pack includes one matching baby and animal. There are also two larger playsets for $14.99 which each include two exclusive sets of babies and animals. When I saw these in Toys R Us on our trip, I decided to buy a six pack for my girls as a surprise from our trip. That way, each girl would get one baby and one animal, and each of them would have a blind bag toy to open. Here's the pack I chose. As you can see, the six pack includes two visible babies and one visible pet, and then two hidden pets and one hidden baby. Much like the Shopkins packaging, the back of the package only shows part of the collection. 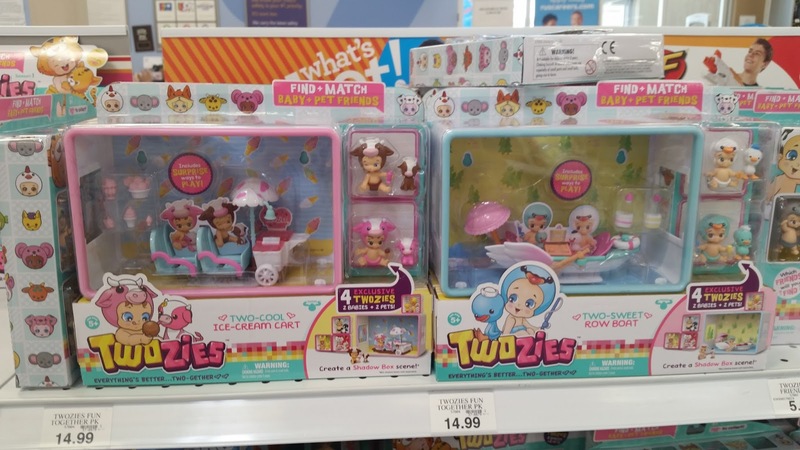 You'll also notice the Twozies follow the same format as the Shopkins, with "Common," "Rare," "Ultra-Rare," and "Limited Edition" versions of the toys. There are also boy and girl versions of each animal. When I went to pick up my girls at my parents' house, I took the Twozies pack with me. 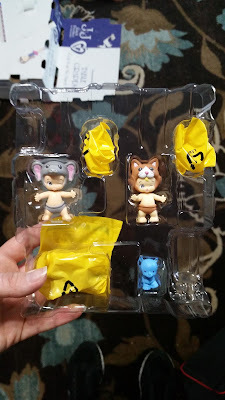 For obvious reasons, the girls didn't want to wait to open them, so I took this quick picture of the inside packaging. You'll notice the blind bag toys inside are packaged much like the blind bag Shopkins. So this is who we ended up with. Little Gal got Nelly (on the left with the gray elephant hat) and Stompy the rhino, Oldest Gal got Chester (wearing the horse hat) and Baaley the lamb, and Middle Gal got Catrick (with the brown kitty hat) and Tocky the...toucan...I think. ;) There's another character that has what appears to be a parrot pet, so I'm pretty sure this is a toucan. We'll take a look at Catrick and Tocky first. 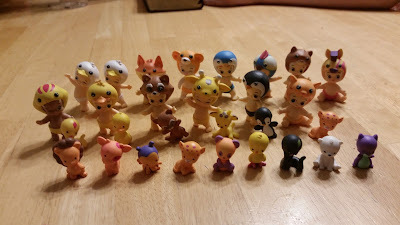 Each of the babies have these holes in their feet, which can be used to attach them to the pegs in their display boxes, or on some of the playsets. One of the things that impressed me the most about these little guys (aside from their adorable faces) is that they are posable at the neck. Oldest Gal discovered that the heads are actually removable. The neck has a knob on the top, and the head has a hole that fits over it. The heads pop right back on. I love that Moose Toys added this unique feature to such a small toy. It gives them so much more personality, and makes playing with them and photographing them even more fun. And now for adorable little Nelly and Stompy. You probably noticed the "T" on the backs of their heads. This is part of their copyright mark, much like the "S" that can be found on official Shopkins. Like the Shopkins, the Twozies come with a collector's guide. Instead of grocery categories, they have themed categories. Inside each blind box are one baby and one animal. The boxes are designed to double as little display cases for the Twozies. There is a peg on the bottom of the box that you can stick in the hole in the baby's foot to keep him or her on display. The back of the box features a little removable bit of "wallpaper," labeled with a theme. This one is from "Two Adventurous." Or, you can opt for this backdrop. ...and how to hang them and attach the baby's feet to the peg. Each blind box comes with its own collector's guide, too. Here's the whole set deboxed. The set comes with a large shadow box display, lined with ice cream wallpaper. A view from the back. You can see the holes toward the top for convenient wall-hanging. Everything fits inside of the box. The ice cream cart has seats for the babies and includes wheels for easy transport. The little freezer at the front of the cart has two opening compartments to store the ice cream. ...and two ice cream cones. The small ice cream cone is super tiny. ...and the small one can fit inside it. The largest and smallest sundaes work the same way. ...and the little one fits inside it. Dorothy and Earl fit perfectly in the seats. There are pegs in the seats to hold them in place, but they stay nicely even without them. The seats can expand to hold the pet cows as well. This set includes two mini ice cream-themed wallpapers. The idea is that you can use them in the mini display cases, in case you want matching displays on the side. So before we wrap things up, I thought it would be nice to take a few photos of the Twozies with some other small dolls and toys. Here's a Twozie baby next to a Shopkin, for size reference. And here's a Twozie animal next to a Shopkin. The Twozies would make great toys or collectibles for 18" dolls like American Girl. They're nice and compatible with mini Strawberry Shortcake dolls. And look cute next to mini Lalaloopsies, too. And here's a Twozie baby next to a Zelf. With my mom's purchase of a twelve pack and a two pack, we were able to complete two of the pairs we'd started with, and ended up with two new pairs as well. ...and Tocky found her Ticky. Trumpet (the elephant) was in the twelve pack, and Toby (the baby) was in the two pack, so now Little Gal's Nelly has a brother and his friend to keep her company while she waits for her elephant friend, Nudge. Tracka and Treaty were the pair included in the twelve pack. I wanted to include pics of these guys to let you know that it doesn't take that long to find a few pairs. 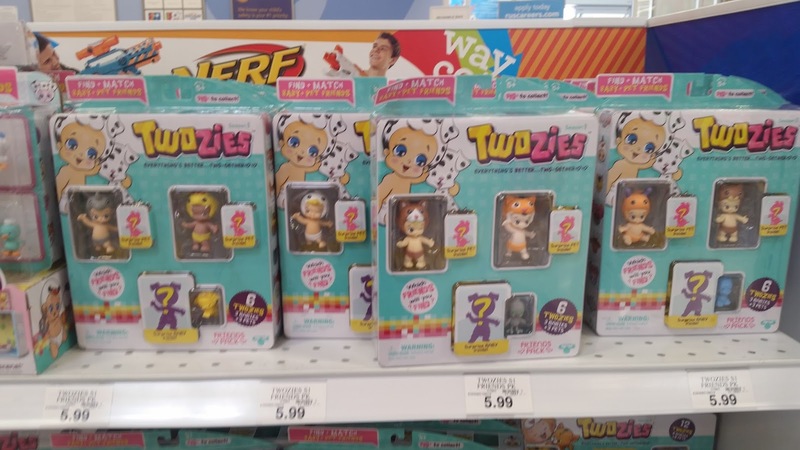 It's actually a bit easier after your first Twozies purchase, because you can search for the ones you need among the visible Twozies. We picked up two more twelve packs, which got us six more pairs. Actually, seven. Middle Gal's kitty pair isn't in the above picture. So again, it is fairly easy to get some pairs right off the bat, which is nice. The Twozies have already provided hours of playtime for my girls. They're great for pretend play or taking along in a purse or pocket. And they work well with other toy lines, such as the Shoppies, Shopkins, Strawberry Shortcake mini figures, or other small toys. 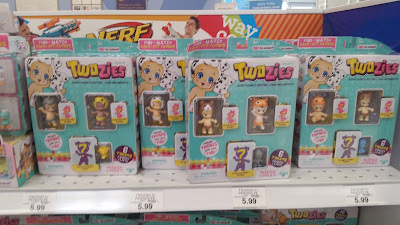 The price on the Twozies is pretty reasonable, and is comparable to other toy lines of similar size and quality. I appreciate that there are different package options, so they can fit in different family budgets. Seriously, my girls have already come up with complex backstories of how their babies and pets got separated and long to be reunited. They keep reminding me to be on the lookout for the missing babies and pets we still "need." I think that the Twozies will see just as much success as the Shopkins. They're cute, small, and continue the fun of the current blind bag craze. As a consumer and a mom, I appreciate the fact that I was able to find pairs for the girls after only two or three purchases. On the other hand, I could see how collecting these could begin to feel never-ending and breed discontent in my girls. I myself have a bit of a completist mentality, so knowing that there will always be a baby or a pet that doesn't match is a little frustrating. I feel like it might be harder to stop collecting this line for that very reason, because we'll always feel like we need that companion for that last pet. What do you think of the Twozies? Moose Toys has outdone themselves this time, between the smart marketing (an ingenious, incredibly addicting plan) and the adorable toys themselves. I love the innocent faces of both the baby animals and the animal babies. The looks on the Twozies' faces melt the hearts of the buyers and convince them to try to find the perfect match. Some of the pairs that I like and want to collect are the cows (Creamy, Dreamy, Cowvin, and Calfy), the sheep (Sheena, Baaley, Woolbur, and Woolsin), the giraffes (Jangles, Bangles, Lofty, and Stretch), and the Limited Edition elephant pair (Rupert and Keepa), but that last pair is an "as if." If these toys are anything like Shopkins, also made by Moose Toys, the Limited Editions will NOT be entering our household. These toys completely captured my heart and more will definitely be added to my stockpile. Would you recommend them to your friends? I would, but I don't think my friends would care for them quite as much. At my age, lots of girls don't play with the toys that I do. I love the fact that they have such lovable faces. What is one thing you would change (if anything)? I think that they're really cute and that it's really smart marketing, because once you get two that aren't a pair, you want to get their matches because you just feel this little connection with them. And once you get another set, you will have more ones that don't have matches, and so on and so on. I really like them, and I think it's smart that Moose Toys made them the right size for the Shoppies to hold. Two that I really want to get are Banda and Deery, the girl deer. I think that my favorite pair that I have already is Milli and Mittens, the purple kittens, because I'm sort of obsessed with cats, and purple's my favorite color. Overall, I think they're really adorable and that they're going to be another successful Moose Toys line. Yes, definitely. I'm not sure if all my friends would like them, but I think they're cute. I think they're really cute. They are probably my favorite Moose Toys line so far. Well, some of them are in kind of awkward poses that make for cute displays but kind of weird play, because on Ticky, one arm is up and the other one is down, and she's kind of twisted, so it's kind of hard to get her in a good pose. I really like the Twozies because they're really cute and I love the poses that they put them in. Some of them look like they're dancing, or finishing a dance, or calling to their pets with a big hug ready for them!!! Their heads can come off and they easily pop back on, so they're really good for young kids because even though they do pop off, they're easily fixed and there are no small joints, like Ai dolls or anything, that could be easily broken. 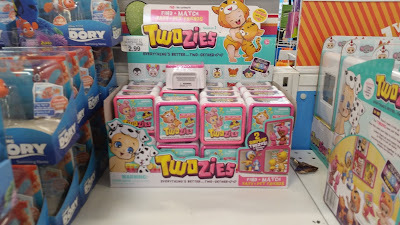 Although they're just in their diapers and nothing else except for animal hats, which I understand because young babies usually just go around in their diapers, they're very very very cute and their pets are too, and although it's really hard to find their matches, you can buy a twelve pack with an automatic match that you can see in the box. They're all really cute except the black cobra is a bit creepy/cute/I don't know, but overall I just love them. There are going to be a lot of Twozies in my room, and it's probably going to be a big mess again! Some of the Twozies. The black cobra they might think is kind of creepy, as I do, but it's a bit cute, in my opinion. Just a teensy tiny bit. I don't know. They're just a really great line, and I just love them. Like, a lot! One of the names I was kind of unsure about. It was an owl and a baby with an owl hat. The owl was named Hooty, but the baby was named...Tooty. It's a just a bit of an awkward name. :D Other than that, I wouldn't change anything. For more information on the Twozies, you can check out the official website HERE, and their Facebook page HERE.